SAN FRANCISCO — As traditional retailing falters, shutting stores and shedding workers, online merchants are reaping the rewards. People like the convenience of e-commerce, and they love the feeling that they are getting a deal. The perception of a bargain is fostered by online retailers’ use of something variously labeled list price, suggested price, reference price or manufacturer’s suggested retail price. Whatever its name, the implication is that people are paying much more somewhere else. But with many products online, you could not pay the list price even if you wanted to. That is because hardly anyone is actually charging it. It is a sales tactic that is drawing legal scrutiny, as well as prompting questions about the integrity of e-commerce. If everyone is getting a deal, is anyone really getting a deal? Here is one recent example of how retailers use list prices to motivate online buyers: Le Creuset’s iron-handle skillet, 11 ¾ inches wide and cherry in color. 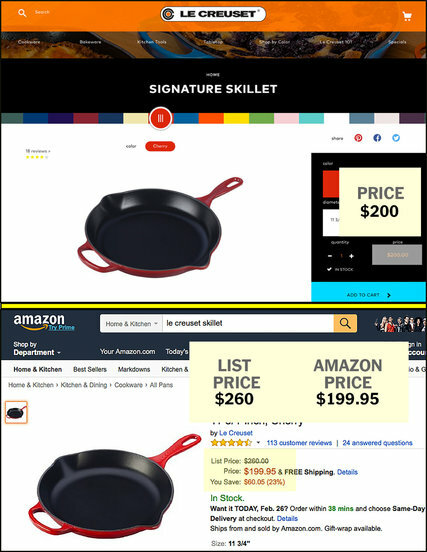 Amazon said late last week that it would knock $60 off the $260 list price to sell the skillet for $200. Sounds like a bargain, the sort of deal that has helped propel Amazon to over $100 billion in annual revenue. Check around, though. The suggested price for the skillet at Williams-Sonoma.com is $285, but customers can buy it for $200. At AllModern.com, the list price is $250 but its sale price is $200. At CutleryandMore.com, the list price is $285 and the sale price is $200. An additional 15 or so online retailers — some hosted by Amazon, others on Google Shopping — charge $200. On Le Creuset’s own site, it sells the pan for $200. Recently, Amazon said it would knock $60 off the $260 list price to sell a Le Creuset skillet for $200. 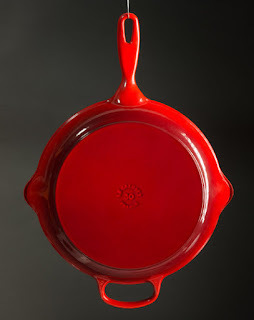 On Le Creuset’s own site, the pan was selling for $200. The use of list prices online is at the heart of a case in a California Court of Appeal. Overstock.com, a popular online merchant, was found liable in a lower court for using misleading reference prices to exaggerate potential customer savings. It was fined $6.8 million, twice the size of the next-largest penalty for false advertising in California. In its appeal, Overstock said it followed “standard industry practices” to come up with its reference prices. Internet retailers including Wayfair, Walmart, Rakuten (formerly Buy.com), Crate & Barrel and Williams-Sonoma employ list prices to varying degrees. Amazon, the biggest e-commerce player, uses them extensively and prominently. “To the extent that list or suggested retail prices do not in fact correspond to prices at which a substantial number of sales of the article in question are made, the advertisement of a reduction may mislead the consumer,” the Code of Federal Regulations states. The F.T.C. declined to comment. 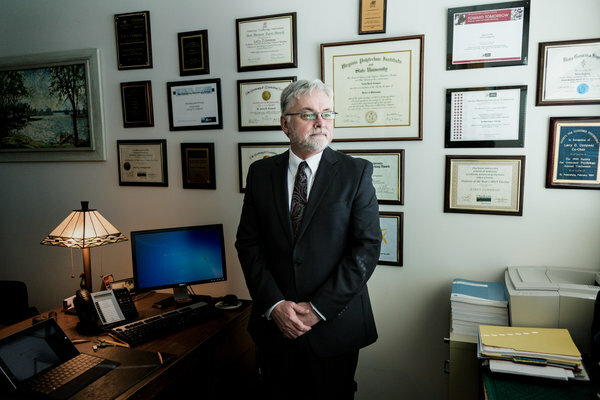 “The list price has become a meaningless piece of information,” said Mr. Compeau, who was an expert witness for the California district attorneys who brought the case against Overstock. Meaningless, but useful. Even as the importance of a fixed list price has waned in the physical world, it has become more deeply embedded online. Retailers, as Amazon indicated, often are supplied with list prices by the manufacturer or the brand. “The manufacturer uses list price in an aspirational way — it’s what they wish they could charge,” said Victor Rosenman, the chief executive of Feedvisor, a start-up that helps e-commerce companies price competitively. The Overstock case went to trial in late 2013. In one example cited by the district attorneys, a man bought a patio set from the retailer. It cost him $450, a discount of 55 percent from the list price of $999. The buyer was somewhat alarmed to find a Walmart price tag on his purchase for $247, a price he confirmed was the going retail price. In another email, Overstock asked a supplier to increase its list price, presumably so the Overstock price would appear even cheaper by contrast. An internal Overstock survey revealed during the trial found that its reference prices were on average 15 percent higher than the highest price that could be found online. Overstock maintained to the appeals court that “injury to consumers was minimal” and said the $6.8 million in penalties was “grossly disproportionate.” A spokesman declined to comment. In an earlier era, list prices were intended to prevent retailers from gouging customers — if $40 was printed on the box, a customer might flee if charged $60. Manufacturers also wanted to signal quality by discouraging deep discounting. They hoped retailers would stick to the printed price. List or reference prices are still used as selling tactics in the physical world, and companies routinely are sued for abusing them. J. C. Penney, for instance, set aside $50 million in November to settle a class-action suit in which it was accused of tricking customers into thinking they were getting big discounts. But online, list prices are even more important. After the Overstock suit, online pricing policies are coming under greater scrutiny. Two customers sued Amazon in late 2014, saying its list prices violated false advertising laws by bearing no relation to the prevailing market prices. The case was dismissed after Amazon pointed out that its customers gave up their right to sue in favor of binding arbitration. Last month, a proposed class-action suit was filed against Wayfair in California asserting that the retailer falsely advertised discounts for items that it had never sold at a higher price. “The referenced former retail prices were fabricated,” the plaintiffs claimed. Wayfair declined to comment. 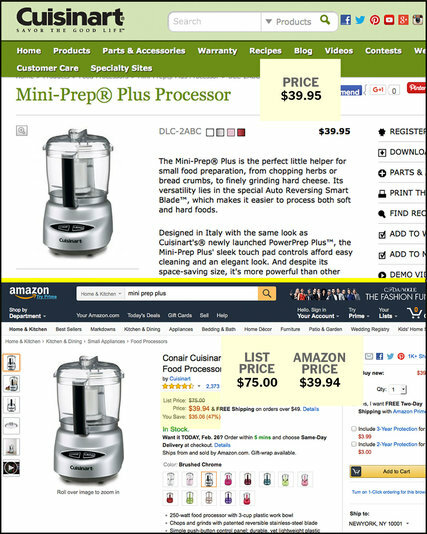 The Mini-Prep Plus Processor was recently advertised on Cuisinart’s website for $40. At the same time, Amazon stated the list price as $75, and its own selling price as $40. One manufacturer, Cuisinart, acknowledged that list price had little meaning. Consider the Mini-Prep Plus Processor, displayed on its website for $40. Amazon says the list price is $75, but in recent weeks was charging $40. That was also roughly what Belk, Bed Bath & Beyond and Kitchen & Company charged. Amazon listed dozens of third-party merchants offering the product, usually from $40 to $50. The Cuisinart Webstore, a separate entity from Cuisinart, sold it for $40. Mary Rodgers, a spokeswoman for Cuisinart, said the $75 list price was “the highest price you could actually see the product being sold for.” She said as far as she knew, no one was selling the processor for that price.